In today’s post, I’m going to share with you my quick and easy lunch options. While I sometimes will stray from these options, these are my go-to’s most days when I want to keep things simple. If you are one for more complex lunch ideas, this may not be the post for you. If you want to see more posts on health and wellness, feel free to leave a comment below and let me know what posts you wish to see in the future. Do you struggle with what to eat? Perhaps you want quick meal ideas and you are told it is possible to make a healthy meal in a short amount of time but you aren’t sure where to start. You are not alone. Nearly every day, I am asked by friends, family, patients, how to improve health without complicated systems, ingredients, or recipes that are time-consuming. So, in an effort to help you out, I am creating a “what I eat in a day” series so that you can acquire new breakfast, lunch, snack and dinner ideas that are time efficient, effortless, whole-foods based, and easy to prepare. A common myth that we believe is that eating healthy is expensive, time-consuming and boring; however, I’m going to show you some rather budget-friendly, quick and tasty lunch ideas to keep you on track toward your health and fitness goals (whether it is to eat healthier or to lose a few LBs). The only supplies we will need for our lunch are an InstantPot or slow cooker, a couple of measuring spoons and a to-go container. Here are the ingredients you will need: organic frozen or fresh chicken breasts, pre-cooked quinoa or sweet potato, shredded cabbage or dark leafy greens, chicken broth or salsa of choice, some simple sauce ingredients for flavoring (coconut aminos, hot sauce, avocado or sesame oil, Bragg’s amino acids, fresh lime juice), and a few toppings such as fresh cilantro, mild jalapeño peppers, avocado, etc. SIDE NOTE: I usually get most of my groceries at Trader Joes or Costco to save money but most of the ingredients I am mentioning are available at most stores. You can grab my free grocery shopping list, HERE! Usually, when I get up in the morning, I’ll start some chicken in the InstantPot with 2 cups of chicken broth. In our house, we use this appliance every single day (I probably should name it). It cooks meat quickly, evenly and really simplifies life for us. Yes, you can use a crock pot if you have one; but, it is nice to have shreddable chicken breasts in less than a half hour. If you are using a crock pot, then prepare a bunch of chicken so you will have enough for the week. To get the chicken extra soft, using the InstantPot, I cook the chicken breasts with the poultry setting and then when it is complete, I steam them for 10 minutes. When it is finished, I fill a glass food-storage container with 2-3 cups of shredded cabbage. I add the shredded chicken. if I am having carbs for this meal, I add ½ cup of pre-cooked quinoa or sweet potato depending on my mood. I pre-cook these on the weekends so I don’t have to mess with it during my daily lunch preparation. I then sprinkle the mix with my favorite combination of sauces. For sweetness, I use several splashes of coconut aminos. For saltiness, I add some Bragg’s amino acids (which tastes like soy sauce). For spice, I add some hot sauce. For tang, I squeeze some lime and for my fat, I add a teaspoon or more of toasted sesame oil or avocado oil. Once I have my flavor I top it off with fresh cilantro and some avocado slices. And that’s really it. I seriously eat some variation of this every day. 1) On the days that a little variety is warranted, instead of cooking the poultry in chicken broth, I may use my favorite salsa from Trader Joes (Garlic Chipotle) to make a tasty salad topper. 2) For other sauce options, I may make a coleslaw using a homemade or vegan mayonnaise with cabbage, cilantro, coconut aminos, and Trader Joe’s Chili Lime seasoning. 3) If I feel like a taco salad, I may mix the shredded chicken with avocado oil and taco seasoning and throw it on a bed of greens. 4) If I’m in the mood for a buffalo wing type of flavor I may mix the shredded chicken breasts with coconut oil and Frank’s hot sauce and top this on a salad. 5) If you are wanting something other than a salad you can opt for Paleo Wraps from Whole Foods and fill your shredded chicken mix in a fun taco wrap. SIDE NOTE: I really don’t measure any of these out except for my oil choice because I track my fat throughout the day when I am trying to stay within a caloric budget. If I need a variety in my protein choice, I may use Applegate chicken sausage, ground turkey, ground grass-fed beef, or grilled steak. 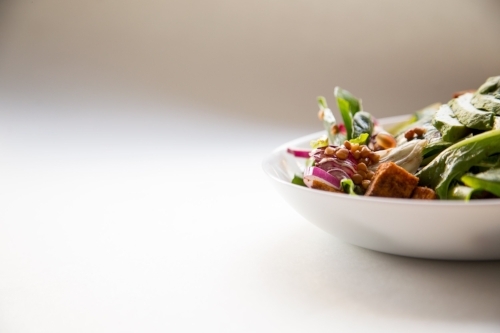 Vegans can try the lunch options above using tempeh, tofu, or Beyond Meat beefy crumbles that are soy and wheat free. Regardless of the method, it usually takes less than ten minutes to get my lunch ready for the day. And this is important because I want to save time and money all while staying true to an anti-inflammatory, fat burning, nutritious meal plan. 1) First, I only go for grain-free options such as quinoa (a seed) and sweet potato or squash. 2) I have between zero and two servings of complex carbs per day (in addition to my fruit and vegetables). Each serving is approximately 1/2 cup. 3) The number of servings depends upon my work out schedule and if I want to have a healthy cheat during the day. For example, If I am on a rest day and do not work out in the morning, I do not add quinoa or sweet potato to my meals. If I worked out that day, I allow myself two servings of complex carbohydrates. If on a day that I work out, I decide to treat myself to an ounce of dark chocolate or a glass of wine, I will replace one or two of my complex carbohydrate servings with a fun cheat. I want to hear from you. If you have any favorite quick, healthy, whole foods-based lunch recipes let me know in the comments below. We can all learn from each other and get new ideas to incorporate into our repertoire. If you want to see more posts like this one, give this post a “like”. Feel free to share it with friends and keep coming back here for more posts related to health and lifestyle.